Long before Gladys Knight recorded Midnight Train to Georgia, Wally was the most famous Pipp in America. He succeeded the notorious Hal Chase as the regular Yankee first baseman and played brilliantly at that position for eleven consecutive seasons. Pipp established several firsts as a Yankee first baseman. He was the first Yankee to lead the American League in home runs. He was the first Yankee starting first baseman to wear the Yankee pinstripes. He was the first one to play in the World Series. He was the first Yankee starting first baseman to play in the now-closed original Yankee Stadium and the first one to play on a world championship team, in 1923. None of those honors mattered, however, when Pipp innocently sat out a game against the Senators on the first day of June during the 1925 season. I’ve read accounts that indicate he was suffering from a headache after getting hit in the head with a ball during batting practice and had asked Yankee skipper, Miller Huggins, for that afternoon off. Whatever the reason, Lou Gehrig, took his place and every Yankee fan knows the rest of that story. Pipp broke into the big leagues with the Detroit Tigers in 1913 and was picked up on waivers by the Yankees on January 15, 1915. He led the American League in home runs in both 1916 and 1917. In fact, the Yankees earned the nickname Murderers Row because of pre-Ruth sluggers like Pipp and Frank “Home Run” Baker. In addition to being a power hitter in the dead-ball era, he was also a good and graceful fielder and smart base runner, stealing 114 bases during his eleven years with the Yanks. Pipp’s best year in New York was 1922, when he hit .329 with 190 hits, 96 runs scored, and drove in 90 more. His best World Series performance was the 1922 Fall Classic when he batted .286 in a losing effort against arch rival Giants. 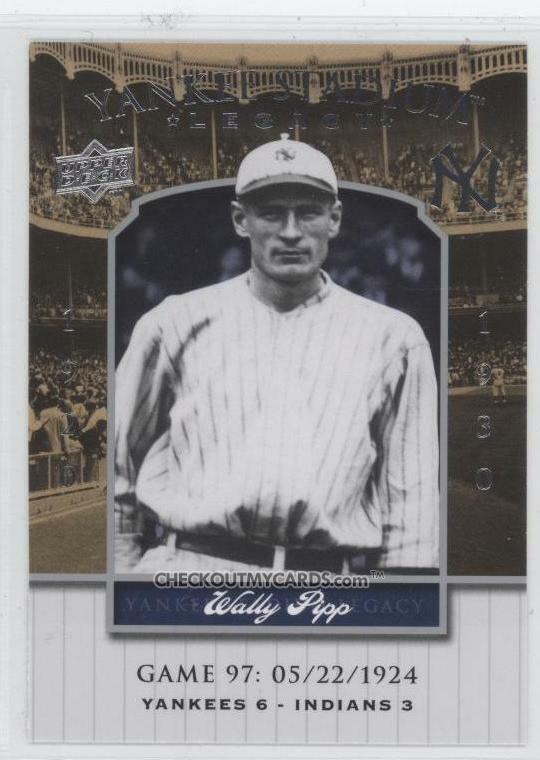 In 1926, the Yankees sold Pipp, outright, to the Cincinnati Reds where he played three more seasons before retiring. He passed away in Rapid City, MI on January 11, 1965, at the age of 71. This former Yankee reliever , this one-time replacement for A-Rod as Yankee third baseman and this Hall-of-Fame Yankee announcer were each also born on February 17th.